Each year, to support its ongoing development, EM Strasbourg Business School creates additional positions. will be available in Management Science. Expertise in one of the following areas would be an asset: Strategy/Entrepreneurship/Innovation or Accounting/Control/Finance or Marketing (5 years of experience in a lecturer/associate professor or researcher position). By joining us, you will be choosing a business school that places research at the forefront by virtue of its two prominent research laboratories, Humanis and Large, specialized in Management and Finance, respectively. At EM Strasbourg, academic freedom is strictly observed and guaranteed for academic staff thanks to flexible work schedules, pedagogical freedom and an everyday environment oriented towards research. 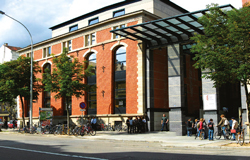 Moreover, affiliated with the University of Strasbourg, our business school offers a particularly conducive environment for the development of interdisciplinary research. Situated in the heart of Strasbourg, a European, student and cultural capital and city of humanistic traditions committed to innovation and respect for the environment, EM Strasbourg also promises an exceptional working environment.